The duty to heal the sick and provide for the poor are deep moral imperatives in the Jewish tradition. Combined with the biblical command to treat the stranger as yourself because you were once a stranger in a strange land, this duty transforms our obligations beyond the worthy interest in promoting the health and well-being of our own community. Our mothers can’t just want their children to be doctors to Jewish people, they must heal whomever is sick-Jew and non-Jew. This element of Jewish philosophy makes the Jews’ stake in health care reform enormous. It is not just about providing insurance to millions of uninsured Americans-caring for children who might not get the vaccinations or the checkups they need, or diagnosing cancer or other diseases early, or making sure people don’t have to choose between bankruptcy and having a needed surgical procedure. For Jews it is about more; it is about holding true to our tradition. Republicans claim they want to repeal and replace the Affordable Care Act. The fact is they have never once offered a coherent ‘replacement’ alternative plan to the ACA that controls costs, provides care to the uninsured and incentivizes better quality care. ‘Repeal and replace’ may be good rhetoric, but unfortunately it is not backed up by any real substance. As Jews, can we really accept living in a country that denies tens of millions of our citizens access to health care insurance? Can we in good conscience let our children-and our neighbors’ children-go without vaccinations, checkups and care for the simplest of ailments? President Obama courageously championed health care reform. He understood the moral imperative. Because he led, millions of families will now be part of the health care system and Jewish doctors will better be able to fulfill their obligations to help save the world. And Jewish mothers can be prouder still that their sons-and daughters-can care for all Americans. The Jewish Social Action Policy Network held its 2012 Annual Meeting at the Pyramid Club in Center City Philadelphia on June 6, 2012. Guest speaker, bioethicist Ezekiel J. Emanuel, M.D., Ph.D., captivated his audience with the many reasons he is “optimistic about the future of the American healthcare system” and why he believes that it will be “vastly improved” by the end of the decade. Dr. Emanuel expressed confidence that the U.S. Supreme Court will find the Affordable Care Act constitutional when the Justices hand down their decision on the healthcare reform law later this month. In his view, there is “No doubt it is constitutional.” “Legally, this is an open and shut case,” he said. The Court can and, he believes, will uphold the Act on grounds relating to the Necessary and Proper Clause, the Commerce Clause and the federal government’s taxing powers. Extolling the landmark passage of the Act by Congress (which he helped to craft), Emanuel traced what he described as “100 years of effort” by former U.S. Presidents and others to reform the country’s healthcare system. The new chair of the Department of Medical Ethics at the University of Pennsylvania and Vice-Provost for Global Initiatives, Emanuel is also an Op-Ed contributor to The New York Times and founding chair of the Department of Bioethics at the National Institute of Health. During the Obama administration’s development of the Affordable Care Act, he served as a Special Advisor on Health Policy to the Director of the Office of Management and Budget and on the National Economic Council. Dr. Emanuel began his remarks by focusing on the magnitude of the cost of the country’s healthcare system, which he said is the largest in the world. According to Emanuel, in 2010, the country spent $2.6 trillion dollars on healthcare, up to 50 per cent more per person than the two other highest-spending countries, Norway and Switzerland. The level of U.S. healthcare spending makes it the fifth largest economy in the world. It is growing by $100 million every year. Don’t miss your opportunity to hear a White House insider’s view of the future of American healthcare. A top healthcare insider is coming to The Pyramid Club on June 6 to address JSPAN and you can be there. Who: Dr. Ezekiel Emanuel, ex-White House advisor on healthcare (also brother of the Mayor of Chicago), will speak on the future of healthcare reform and American medicine. 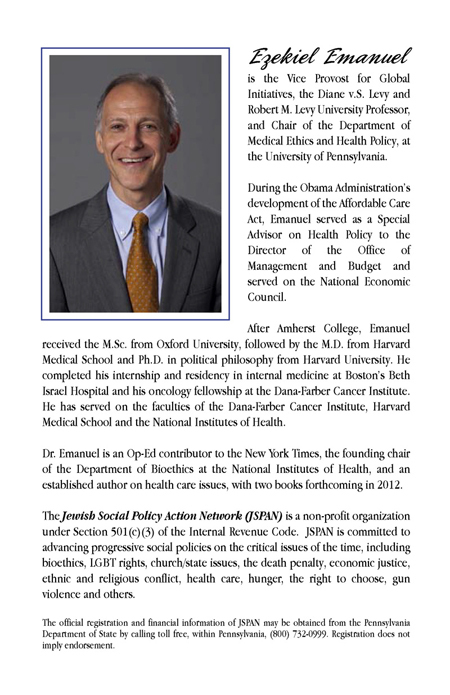 Emanuel, Chair of the Department of Medical Ethics and Health Policy at the University of Pennsylvania, is well known on the Op-Ed page of the New York Times and in the media. He headed healthcare at the White House Office of Management and Budget in 2009-10, during the design and Congressional passage of the Affordable Care Act. When: The event is at 7:30 pm on Wednesday June 6. Where: The Pyramid Club, 1735 Market Street, Philadelphia. With a great dessert buffet, the cost is $10 (free to JSPAN members with 2012 dues paid). Discount parking is available. RSVP Required: [email protected] or phone 215-635-2554. Pro-Israel activist Steve Sheffey wrote an opinion piece for The Jerusalem Post warning about the false smears likely to be spread by right-wingers against President Barack Obama’s strong pro-Israel record as the presidential campaign heats up. 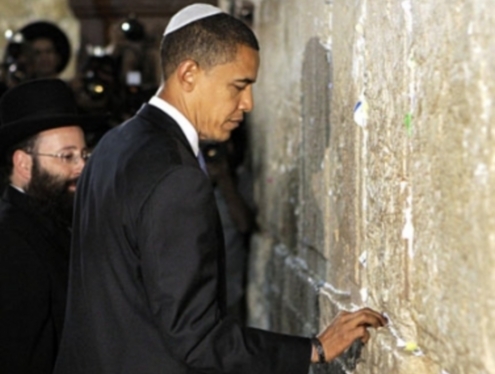 The campaign to delegitimize President Obama in the eyes of pro-Israel voters will only intensify between now and November 6…. Opponents of territorial compromise and Americans who use concern for Israel to mask concern about paying their fair share of taxes compose most of the 20-25 percent of Jews who vote Republican. But that’s not enough to win an election; hence their efforts to distort President Obama’s record on Israel. Most Jews support the Democratic domestic agenda, so if there is no reason to oppose the president based on Israel, there is no reason to oppose him at all. Obama has called for the removal of Syrian President Bashar Assad, ordered the successful assassination of Osama bin-Laden, done more than any other president to stop Iran’s illicit nuclear program, restored Israel’s qualitative military edge after years of erosion under the previous administration, increased security assistance to Israel to record levels, boycotted Durban II and Durban III, taken US Israel military and intelligence cooperation to unprecedented levels, cast his only veto in the UN against the one-sided anti-Israel Security Council resolution, opposed the Goldstone Report, stood with Israel against the Gaza flotilla, and is mounting a diplomatic crusade against the unilateral declaration of a Palestinian state. President Obama has surrounded himself with pro-Israel advisers, from Hillary Clinton to Dan Shapiro to Joe Biden to Rahm Emanuel. Yet we still hear about alleged influences from Obama’s past. Obama has been president for nearly three years. Evaluate President Obama the way the pro- Israel community has always evaluated our leaders and representatives: by looking at what they’ve done, not by trying to read their minds or via conjectures about influences that are impossible to prove or disprove. If unprecedented military cooperation between the US and Israel, unambiguous opposition to a unilateral declaration of a Palestinian state, and unrelenting defense of Israel in international forums is what happens when someone knows Jeremiah Wright, we ought to send all our candidates to his church. President Obama’s record proves that he is one of the best friends of Israel ever to occupy the White House. The only question is whether attempts to manipulate the emotions of pro-Israel voters by distorting the president’s record will succeed. The answer depends on our ability to separate fact from fiction. Rahm Emanuel was sworn in today as the first Jewish Mayor of Chicago. He also served in the U.S. House of Representatives as part of the Democratic leadership and as White House Chief of Staff to President Barack Obama. Rahm Emanuel was born in Chicago, Illinois in November 1959. He received his Bachelor’s degree in liberal arts from Sarah Lawrence College in 1981 and his Master’s degree in speech and communication from Northwestern University in 1985. Emanuel’s political involvement began with David Robinson’s 1980 congressional campaign while he was still an undergraduate student. In 1984, he worked on Paul Simon’s U.S. senate campaign. Upon graduating from Northwestern, Emanuel worked for the public interest group Illinois Public Action. In 1988, he served as the national campaign director for the Democratic Congressional Campaign Committee (DCCC), and in 1989 was a chief fundraiser and senior advisor for Richard M. Daley’s mayoral campaign. In 1991, Emanuel volunteered with the Israeli Defense Force during the Gulf War as a civilian volunteer. Later that year, he joined President Bill Clinton’s presidential primary campaign as the finance director. Following Clinton’s victory in the general election, he named Emanuel as one of his senior advisors from 1993-1998. Among his many achievements in this role, Emanuel worked to plan the 1993 signing of the Oslo Accords by Israeli Prime Minister Yitzhak Rabin and PLO leader Yasser Arafat in the White House Rose Garden. Taking a brief respite from politics, Emanuel joined the investment banking firm Wasserstein Perella from 1998 until 2002. In 2002, he succeeded in his bid for the House of Representatives seat representing Illinois’ 5th district. He won re-election in 2004, 2006 and 2008. Following the death of DCCC Chair Bob Matsui in 2005, Emanuel was appointed as head of the DCCC by House Minority Leader Nancy Pelosi. During his tenure, he orchestrated the large Democratic gains made in the 2006 midterm elections. He is credited by many for regaining a Democratic majority in the House for the first time since 1995. In 2007, the House Democratic Caucus elected Emanuel as Chairman for the 110th Congress. After President Obama’s success in the 2008 presidential election, Emanuel accepted the position of White House Chief of Staff, and resigned his House seat. In a New York Times article, Emanuel was described as “perhaps the most influential White House chief of staff in a generation.” In September 2010, he announced his departure from his White House position in order to pursue the Mayor’s office in Chicago. Emanuel won the election in February 2011. By receiving 55% of the vote against 5 opponents, he avoided a run-off race in April. Emanuel and his wife Amy Rule have three children, and currently reside in Chicago, Ill.